Eric Devine stood in the Indiana Convention Center in Indianapolis carefully measuring scoops of rice for pre-packaged meals. Someday, more than 5,300 miles away in Burkina Faso, someone will not starve because of the meals he helped prepare. He and other members of his parish’s youth group were among the 3,000 youths, chaperones and youth ministry leaders who prepared bagged meals for the Helping Hands program—formed of a partnership between Catholic Relief Services and Rise Against Hunger—during the National Catholic Youth Conference (NCYC) in Indianapolis on Nov. 16-18. 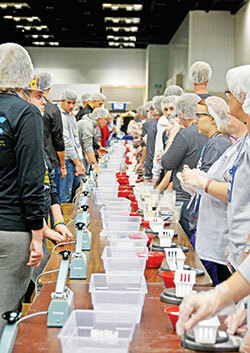 By the end of NCYC, 100,000 meals were prepared to send to the West African country. But the assistance doesn’t stop with sending meals. The funds are used for purchasing seeds and water infrastructure for irrigating fields. Helping Hands also offers job skill training such as sewing, raising livestock and how to grind grain—“ways that they can make money on their own,” says Holmes. An example she cites is a project the program initiated in a town in Burkina Faso. “We got a group of 120 farmers—men and women—and taught them how to plant a crop that was better during the dry season, and that was actually onions. We worked with them to bring in a water pump and piping so they could pipe the water into their land. The first crop was like four tons of onions they were able to harvest. Participants at NCYC took to the concept of making a difference as they gathered around bag-filling and -sealing stations in 45-minute shifts, including 10 minutes of education about the project, whom it serves, why and how. Jessica Watson of the Archdiocese of Washington couldn’t agree more. Comments like these are rewarding to Holmes. “We love to hear that response!” she said. “We hope they leave thinking about the people in Burkina [Faso], and the fact that they don’t have food every day.